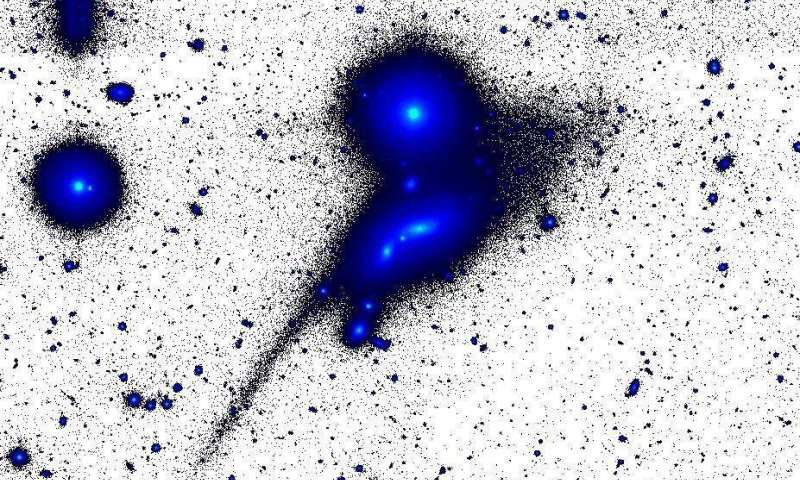 "We have found a giant, exceptional relic of a disrupted galaxy," says Dr Noah Brosch, of The Florence and George Wise Observatory at Tel Aviv University's School of Physics and Astronomy, who led the research for the study. When galaxies are disrupted and disappear, their stars are either incorporated into more massive galaxies or are ejected into intergalactic space. "What makes this object extraordinary is that the tail alone is almost 500,000 light-years long," says Prof. R. Michael Rich of the University of California, Los Angeles. "If it were at the distance of the Andromeda galaxy, which is about 2.5 million light years from Earth, it would reach a fifth of the way to our own Milky Way." Drs Brosch and Rich collaborated on the study with Dr Alexandr Mosenkov of St. Petersburg University and Dr Shuki Koriski of TAU's Florence and George Wise Observatory and School of Physics and Astronomy. "The extragalactic tadpole contains a system of two very close 'normal' disc galaxies, each about 40,000 light-years across," says Dr Brosch. "Together with other nearby galaxies, the galaxies form a compact group." The galaxy is part of a small group of galaxies called HCG098 that will merge into a single galaxy in the next billion years. Such compact galaxy groups were first identified in 1982 by astronomer Paul Hickson, who published a catalogue of 100 such groups. The Hickson Compact Groups examine environments with high galaxy densities that are not at the core of a "cluster" of galaxies (clusters contain thousands of galaxies themselves). The "tadpole galaxy" is listed as No. 98 in the Hickson Compact Group catalogue. "In compact group environments, we believe we can study 'clean' examples of galaxy-galaxy interactions, learn how matter is transferred between the members, and how newly accreted matter can modify and influence galaxy growth and development," says Dr Brosch. For the research, the scientists collected dozens of images of the targets, each exposed through a wide filter that selects red light while virtually eliminating extraneous light pollution. "We used a relatively small, 70-cm telescope at the Wise Observatory and an identical telescope in California, both of which were equipped with state-of-the-art CCD cameras," says Dr Brosch. The two telescopes are collaborating on a project called the Halos and Environments of Nearby Galaxies (HERON) Survey.